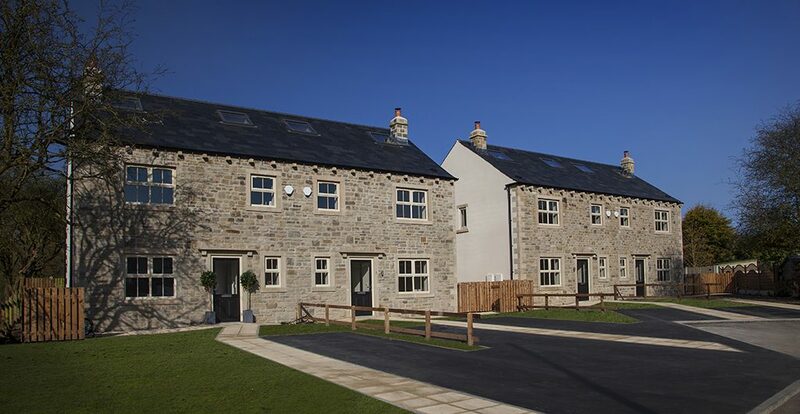 Bowman Riley designed Carltonside Fold, four semi-detached family homes in Skipton for local developer, Candelisa. The homes are located within a residential area on land that was formally council owned garages. The site had previously been granted outline planning for the principle of the development with all matters reserved. We submitted a new full planning application to avoid any complications that might arise later in the project. The site is bounded by a row of houses and a recent housing development. The layout of the site had to consider the overlooking distances from the existing properties. Access had to be maintained through the site to the area of land to the south purchased by Candelisa for a future development. Due to the close proximity of the land to the flood zone and the existing ground conditions, the properties had to use pile foundations. The three bedroom properties feature an open plan kitchen and dining area with folding doors onto private gardens, a separate lounge with log burning stove, an additional large attic room and two private parking spaces. The desirable new houses were all sold prior to completion and occupied in April 2016 contributing to meeting the demand for additional homes in the Craven area of North Yorkshire.